Welcome to another edition of PuzzleNation Blog’s interview feature, 5 Questions! We’re reaching out to puzzle constructors, video game writers and designers, board game creators, writers, filmmakers, musicians, and puzzle enthusiasts from all walks of life, talking to people who make puzzles and people who enjoy them in the hopes of exploring the puzzle community as a whole. And I’m excited to have Jim Deacove as our latest 5 Questions interviewee! For more than 4 decades, Jim Deacove has been designing games for Family Pastimes, a Canadian board game company (and family business) dedicated to cooperative gaming. With over one hundred games to his credit, Jim is one of the most prolific and passionate game designers at work today. Whether he has players teaming up to serve hungry customers (Bus Depot Diner), keep the livestock happy while predators lurk nearby (Coyote! ), or pull off a flawless magic show while avoiding being trapped in their own tricks (Amazing Illusions), Jim’s games are bright, colorful, creative, and many are appropriate for all ages. And that’s not getting into his puzzlier efforts, like AARI (an acronym/abbreviation-themed scrabble variant) or Gridlock (a sliding-tile puzzle game about a monster traffic jam). Jim was gracious enough to take some time out to talk to us, so without further ado, let’s get to the interview! 1.) How did you first get into board games? When I was about 5 years old, my mother says I began making up board games with paper, crayons and various items from my dad’s woodshop. My inspiration came from looking at pictures of games such as Sorry and Monopoly in what was a popular Christmas catalogue, Eaton’s. We were too poor to buy them, so I made imitations of what I thought the games were about. As they say, the rest is history. 2.) Family Pastimes is rare, in that the company focuses completely on cooperative games, whereas most board games are built around competing with other players, not working with them. How is designing cooperative games different from designing more traditional board games? I used to design competitive games in high school, mostly strategy games, because I played Chess a lot until in university, I lost the taste for blood. I also designed competitive games on sport themes, largely for my and my friends’ enjoyment. I once designed a world political game that took three days to play and I agreed with a player who said that life was too short to spend so much time on a game, designing or playing one. I have always found designing games to be easy, once I get in the mental space that lets the ideas flow, this is usually assisted by a warm bath or by keeping a notebook by my bedside, because some of my best ideas have come while I am asleep. I record them upon awakening. 3.) What, in your estimation, separates a great game from a run-of-the-mill game? Probably time. Some games hold up, others don’t and it is difficult to judge even then, because what is one person’s run-of-the-mill is another person’s great game. But even time is suspect. I know this will enrage some folks, but Chess has held the interest of humans for a long time and could be described as a great game, while Checkers has also held up, but personally I think Checkers is a run-of-the-mill game. 4.) 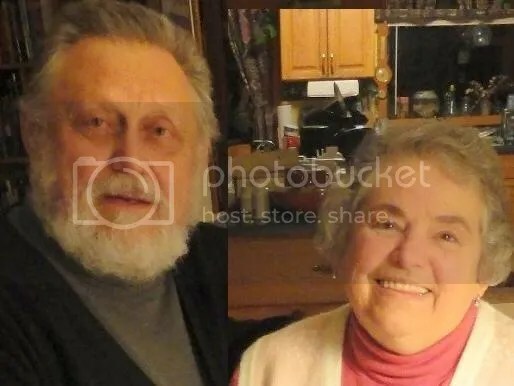 What’s next for Jim Deacove and Family Pastimes? I thought of retiring and taking up other pursuits that have been just a hobby up to now — cartooning, jazz drumming, oil painting, running a live theatre, finishing a variety of writing projects, etc. — but the game ideas keep on coming. The real world is so full of inspiring themes. For example, one of my new designs, Moon Mission, was inspired by the landing of the Curiosity Rover on Mars and witnessing the expressions of joy in the NASA Control Room when it happened. Who says a collaborative effort can’t be exciting? My plan is to keep on going with new designs. I can’t help it. It’s my work. As I say to folks who chide me saying, “You have to start getting out more. You are 75 years old and your expiry date is nearing.” Hey, I reply, never mind the expiry date, I still have room on my “Best Before” date. 5.) If you could give the readers, writers, aspiring game designers, and puzzle fans in the audience one piece of advice, what would it be? Make cooperative games. Please. We have enough of the other game experience. And, it’s selfish, I know, but I always enjoy playing someone else’s cooperative game for a change. Oh, and keep your day job, and avoid having a garage, because that is where you will end up storing unsold cartons of your game. Many thanks to Jim for his time. 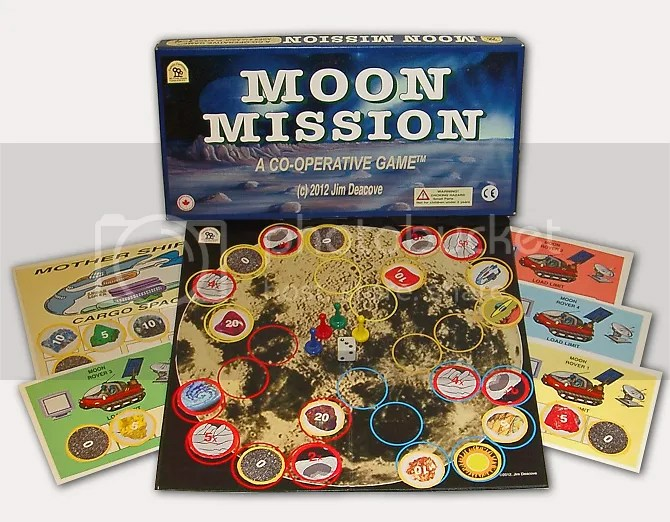 Check out Jim’s library of cooperative board games at Family Pastimes. I can’t wait to see what he cooks up next.